The 2010 BP Deepwater Horizon disaster caused a fatal disease never seen before in dolphins living the in the Gulf of Mexico, according to a new report from National Oceanic and Atmospheric Administration (NOAA). The study finally gives verdict to whether or not petroleum exposure caused the biggest dolphin die-off ever recorded in the Gulf of Mexico. “No feasible alternatives remain that can reasonably explain the timing, location and nature of this increase in death,” co-author Stephanie Venn-Watson of the National Marine Mammal Foundation in San Diego said in a press conference announcing the study. This forensic investigation is part of NOAA’s long-term ecological analysis of the Deepwater incident that was started in 2013, known as the Natural Resource Damage Assessment. BP* has always challenged the link between the current slate of dolphin deaths — more than 1,300 in five years — and the Deepwater Horizon oil spill, which leaked an estimated 4.9 million barrels of oil into the Gulf of Mexico between April and September 2010. Unusual mortality events (UMEs) — where large numbers of dolphins and other members of cetacean family perish in a short timeframe — are common in nature. Between 1991 and 2010, at least 10 of these mortality events had happened in the Gulf, primarily due to marine outbreaks of dolphin-related viruses and bacteria. Plus in the three months immediately prior to the Deepwater accident, 25 dead dolphins washed up near the Louisiana and Mississippi border. However, today’s study announces a firm connection between the petroleum exposure caused by the Deepwater accident and the ongoing UME — the biggest in the recorded history of the Gulf. Prior to the Deepwater incident, the longest recorded UME had lasted 17 months from 2005 to 2006, while the most fatal occurred in 1990 — claiming 344 bottlenose dolphins. 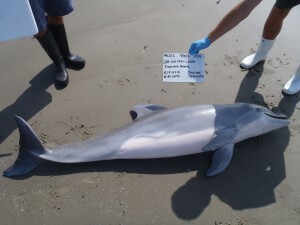 In the study published in PLOS ONE, NOAA examined the major organs of 46 dolphins that died along the coasts of Louisiana, Mississippi and Alabama during June 2010 to December 2012. The researchers then compared these specimens to a control group of 106 dolphins that washed up either off the coastal Carolinas between 1996 to 2012 or off the Gulf Coast of Florida and Texas prior to the Deepwater oil spill. The researchers argue that when the dolphins swam to the surface for air, oil fumes and liquid petroleum leaked through their blowhole into the lungs and caused disease. The mortal blow for most of these marine mammals came in the form of shrunken, thinner adrenal glands, which had never been previously observed in Gulf dolphins. 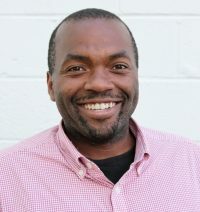 “Animals with untreated adrenal dysfunction can essentially be balancing precariously on a ledge, waiting for the right stressor to push them into an adrenal crisis,” Venn-Watson said. Much like in humans, adrenal glands produce hormones that help the body cope with physical stress. For dolphins, this stress usually comes in the form of dealing with the cold ocean water, pregnancy and naturally occurring bacteria that float around them. Without normal adrenal glands, the findings argue that the dolphins became susceptible to bacterial pneumonia — a condition that can damage the lungs to the point of suffocation or can completely impair the mammal’s immune system through septic shock. In contrast, only one in 50 of the control animals from other parts of the Gulf had evidence of bacterial pneumonia. “Aside from chemical exposure, conditions that can cause adrenal dysfunction are cancer, autoimmune disease and tuberculosis. We didn’t find any of these additional causes,” Colegrove said. Red tide toxins and infectious causes of past dolphin die-offs — morbillivirus and Brucella bacteria — were ruled out for the majority of these cases too. The worst injuries were spotted in Barataria Bay, Louisiana — 40 miles due south of New Orleans. 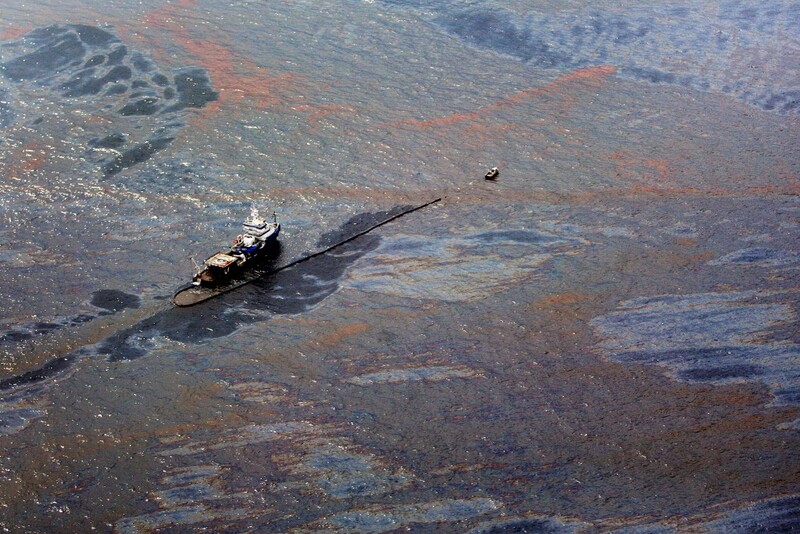 This location was hit hardest by the spill — with oil coating close to 25 miles of shoreline. NOAA previously found that sea turtles have died or have been displaced due to the oil spill. In January, a federal judge lowered the maximum cap on BP’s fine to $13.7 billion from $18 billion. A Congressional report from April says that BP has volunteered another $14 billion for cleanup operations and proposed another $1 billion on early restoration projects. “The results from our study paired with what’s been previously published indicate that dolphins were negatively impacted by exposure to petroleum compounds following the Deepwater oil spill. Exposure to these compounds has contributed to the increase in dolphin deaths in the Gulf of Mexico,” Venn-Watson concluded.